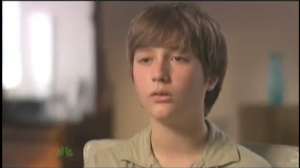 RIO DE JANEIRO, BRAZIL – Sean Goldman, a young boy who was at the center of a huge custody battle in Brazil in 2009, tells U.S. news program Dateline host Meredith Vieira of the ordeal which sparked international debate and lasted more than a year. Sean Goldman tells Meredith Vieira of his experiences two years ago, image recreation. In his first interview about the case, Sean Goldman, now eleven years old, spoke of his feelings of sadness when he remembers the widely documented court case two years ago in which, following the death of his mother, his maternal grandmother and stepfather fought for custody against the boy’s paternal father in New Jersey (U.S.). The case caused controversy, both in the U.S and Brazil, even attracting the attention of President Barack Obama and Secretary of State Hillary Clinton. Ultimately, after a lengthy court battle, Sean was returned to his father David Goldman with whom he now resides. Once upon a time, this was a story with no bad guys. A dad who loved his son, a stepfather who loved his stepson, a grandmother who loved her grandson, and cared for him after losing her daughter, as is common in Brazil. But now, what we have is a propaganda war between the father and the grandmother, both of whom marshal their respective media forces in favor of their position. If we are to believe what we read, Sean is doing well and seems focused on putting the media circus behind him. It will only go back to being a story with no bad guys, if the father and grandmother bury the hatchet and make peace. Sadly, this seems increasingly unlikely. Agree with a 100% michael, it’s actually kind of simple but I don’t believe it’s in the menu for them. I also like to say that I dont consider Mr. Silva Lins relevant in this fight at all, it’s embarrassing for him to even try, especially since he’s supposed to be this great lawyer. Rich people in brazil don’t like to loose a fight… Pack it up it’s a loss. The end. Yeah, let them take your child away from you to another country and never let you see this child see how you feel then. This case was pretty cut and dry and it’s unfortunate it got dragged out as long as it did. Under the Hague Convention, which Brazil is a member of, Sean should have been returned to the US within 6 weeks. Nonetheless, even w/o this law, after the mother died, the father is the next of kin and had the right to custody of his own son. The grandmother is out of line by continuing to pursue her appeal. I’m sorry, NO bad guys? A grandmother who aided her daughter in taking a child away from his home, country and father? A step-father who lied to the courts, telling them that the boy had been ABANDONED by his father, and tried to legally adopt him, thus attempting to deny the father of ever seeing his son again? A family that didn’t tell the father about the death of the mother and then kept him from even VISITING his son on the dozens of trips he made to Brazil? A family that told a four-year old boy to forget his father, his country, his primary language and his “other” life and just “move on?” You don’t consider these bad guys? I wonder what universe you live in? I wonder if you would be so excited to “bury the hatchet” with a group of people who kept your young child from you for 5+ years? Who lied about you and caused you pain and made you assume legal bills that will take years to pay off. Somehow, I can’t imagine. Even Sean doesn’t want to go back there until he is older and stronger. You can only imagine the pain this has all caused him. But no bad guys, no. All good….